Places to see in Rajendrapur: The simple and slow moving village life of Rajendrapur would surely make you envious. You would find the farmers ploughing their fields, children chasing ducks, fisherman casting their nets and the village elders sitting under the Peepul tree discussing the year’s crops. 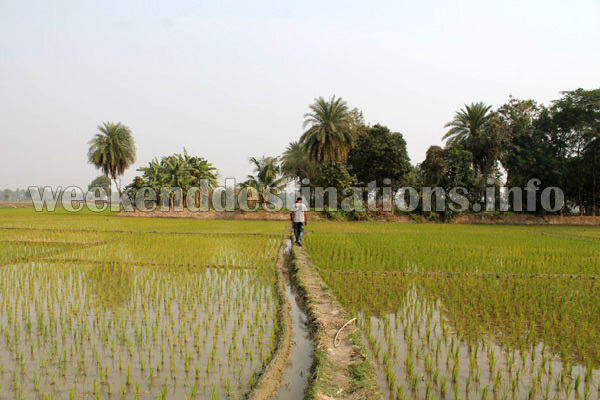 Paddy and mustard fields stretch as far as your eye can meet on one side of the village, while the other side has vegetable gardens, ponds and mango orchards. The mango grove is more like a hideout surrounded by green fields, vegetable gardens and a placid pond teeming with carps. 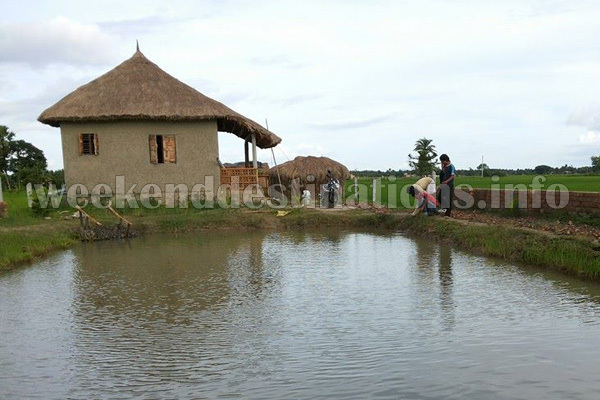 A walk through the paddy fields would take you to this peaceful refuge. Nearby attractions of Rajendrapur: Take a ride in the local van rickshaws to the famous Vidyadhari River at nearby Malancha (around 6 kms from Rajendrapur). You can watch the setting sun from the bridge over Vidyadhari River. 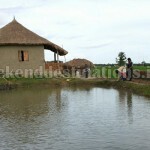 Rajendrapur is surrounded by large fishing ponds and a mango grove. Fish lovers can also visit nearby Malancha Village, while returning from Rajendrapur to buy some fresh catches. Malancha is one of the biggest fish markets in West Bengal. Things to do in Rajendrapur: Take a village walk in the paddy fields and chase the ducks to the puddle. If bird watching is your hobby, then the early mornings of Rajendrapur can yield some nice surprises for you. But the best thing to do in Rajendrapur is to become a part of the village life. You can take long walks taking to the edges of paddy fields, do some fishing, try out khejur rash (date palm juice) early mornings, play badminton, bring out eggs from the duck house, do some campfire in the evenings and simply de-stress your weekend. Family addas during the afternoon and evening in the gazebo with a barbeque can be a unique thing to do during your stay here. Essentially, a stay here is a 2 days of peace in the green. How to reach Rajendrapur: If you are going by car, then you have to take Basanti Highway from Science City and take the road turning right before Malancha. All Buses connecting Malancha from Kolkata will take you to Rajendrapur. Lodging and dining facilities at Rajendrapur: Presently, there are two mud houses in the eco village for guests to stay. 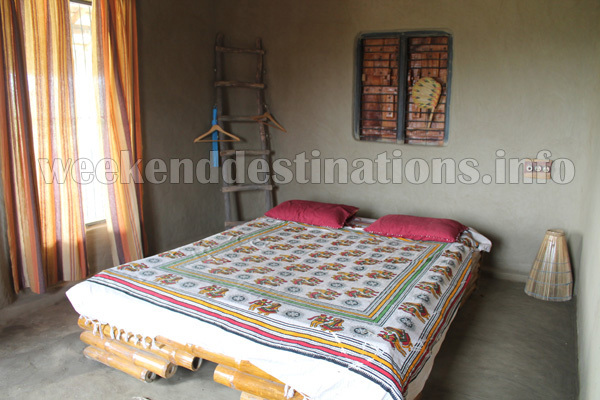 Located beside the ponds overlooking the paddy fields and gardens, these spacious Double Bed ethnic mud houses are equipped with all modern facilities like electricity and attached western bathrooms with 24-hrs water. You would also have a private balcony to your mudhouse. There is a dining area and two kitchens. Driver’s accommodation and parking facilities within the eco village is available. If you are fond of having your food cooked with firewood, then the traditional kitchen with mud ovens can be utilized. However, a modern kitchen also meets the needs of the guests. Food is essentially traditional Bengali cuisine.